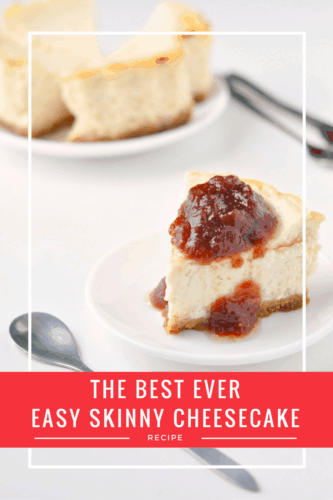 The Best Ever Easy Skinny Cheesecake Recipe in the World! When I first developed this recipe, I never thought it was going to be as good as it is. The worst part a low-calorie cheesecake is using low-fat cream cheese. This ingredient can often leave a weird, dry taste in your mouth. To counteract this undesirable effect, I use tangy, creamy fat-free yogurt. The result? Better than I could ever have hoped for ever, ever, ever! Actually, no. The worst part about an easy skinny cheesecake isn’t the low-fat cream cheese. It’s the base. I’ve seen everything from cheesecake bases made from crushed nuts to oats. Believe me, I’ve tried every single healthy cheesecake base there is and I’ve come to the conclusion that there simply isn’t one. When it comes to skinny cheesecakes, simply skip the crust or scale down a normal graham cracker crust. Those are the only two options for something that actually tastes like a real cheesecake. 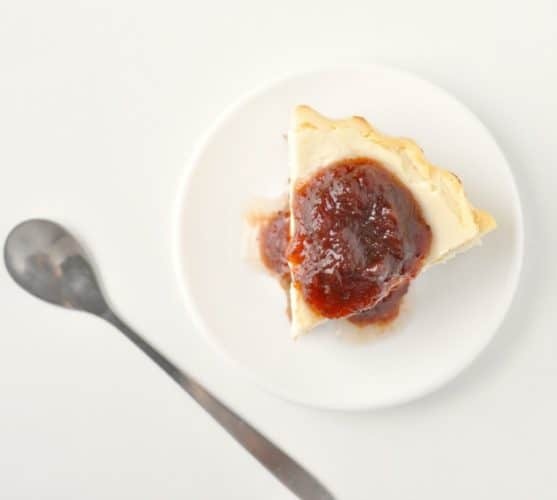 I’ve been writing my whole life, but I don’t think I can even begin to tell you how much I love this easy skinny cheesecake. The crust is perfect – just the right amount of sweet with a wonderful buttery flavor and the perfect crumble. But it’s nothing compared to the filling. Imagine the most amazing baked and no-bake cheesecake hooked up and had a baby. This cheesecake is what that baby would turn out like! So let’s see. This easy skinny cheesecake has got the perfect textures and the most amazing flavors. What else is there about it that you could possibly want to know? Oh yes, the most important part. It’s healthy! Each slice (and I’m talking about a big, proper slice) comes in at just 250 calories and the whole thing has a lot less sugar and fat in than your standard cheesecake. But that doesn’t mean you can double up on slices. Portion control! This easy skinny cheesecake recipe has still got some sugar and some fat in, which is why I’ve deemed it “skinny” and not “healthy”. If you’re looking for an even healthier cheesecake, try my Healthy 160-Calorie Cheesecake (it’s packed with protein) or better still, my 100-Calorie No-Bake Calorie Cheesecake (served up in super-fancy champagne glasses). Cheesecake is a hugely popular dessert and with this recipe, you don’t need to miss out if you’re watching what you eat. 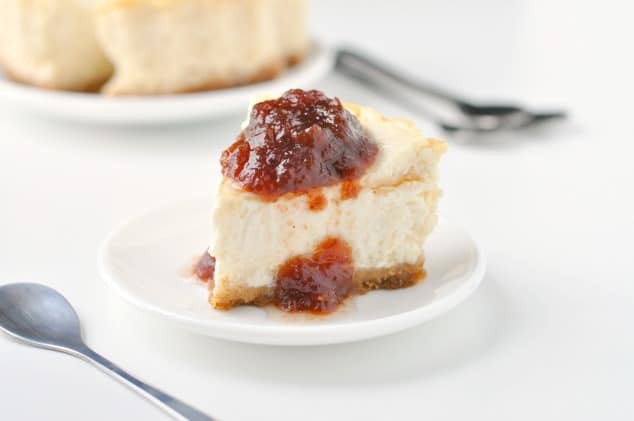 Since the cheesecake only spends 60 minutes in the oven, it’s light and fluffy on the outside like an ordinary baked cheesecake and slightly underdone and creamy on the inside, just like a no-bake cheesecake. It really is the best of both worlds – not bad for an easy skinny cheesecake recipe, right? Preheat the oven to 350F/175C. Place the graham crackers into a food processor and process until they've completely broken down into fine crumbs. Put the butter into a microwave-safe bowl and microwave for 60 seconds or until melted. Stir the melted butter into the cookie crumbs until it's been totally absorbed. Scoop the buttery cookie crumbs into a 12cm/5" round greased cake pan and press down firmly with the back of a dessert spoon to form the base. Set to one side. Quickly rinse out the inside of the food processor and add in the cream cheese, yogurt, sugar and vanilla extract. Process for 60 seconds until combined. Crack in the egg and pulse 3-4 times until it's just incorporated. Don't over-mix or the cheesecake will crack in the oven. Scoop the cheesecake filling on top of the base and bake in the pre-heated oven for 30 minutes. After 30 minutes, turn the oven off but leave the door closed and leave the cheesecake inside for a further 30 minutes. After a total of 60 minutes, remove the cheesecake from the oven and leave on the counter for at least 4 hours to cool to room temperature. Cover with plastic wrap and chill in the fridge for at least 8 hours before cutting into 6 slices. 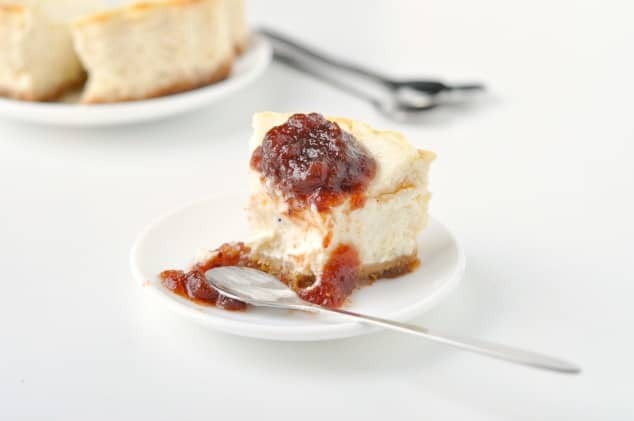 The cheesecake will keep perfectly well in the fridge for up to one week or in the freezer for up to six months. What kind of cookies did you use? I’m based in the UK, so I can get them a lot cheaper than that! Any similar lemon sandwich cookie or even Graham Crackers would work just as well. I know just what you mean, Krissy! The 80-20 balance is great – no one wants to stick to salads and water all the time, right?! Processed some raw sugar granules before adding the cream cheese and yoghurt, etc. in place of the white sugar. In keeping with the unbleached theme I used some Back to Nature graham cracker sticks from Whole Foods. This sounds heavenly! Do you think it would work to use Stevia in place of the white sugar? I meant double the cheesecake part not the crust. I’m so happy you like my recipe, Rachel! You’re right – the cheesecake can be quite shallow, depending on the tin you bake it in so I do sometimes double up the filling so it’s nice and tall. I’ve tried so many other skinny cheesecake recipes and I really can’t find a one that’s better than this. Wow, I’ve been on the hunt for a lower calorie cheesecake recipe and yours looks amazing!! Around the holidays especially you really want to enjoy dessert without overindulging – this recipe is perfect for that! I totally agree with you, Taylor. This recipe is the perfect balance between indulging and staying healthy! Wow, it sounds like you are an expert on skinny cheesecake. I am sure it can be tricky so I’m glad you figured it out for us. Must make this for my hubby. He will love it! Thanks so much, Karen! I swear, I’ve made so many versions of this that I really am the expert! Cheesecake is a must when my family gets together especially around the holdiays. This lightened up version sounds and looks marvelous! I love that you used yogurt in the batter. Merry Christmas! I know, right?! I use yogurt in practically everything in place of cream or other things. I’ve made a tofu cheesecake before, but I’ve only ever seen recipes for cashew cheesecakes – never tried one myself. I love cashews so I’ve really got to give it a go at some point! I’m having to keep my diet pretty low in fat right now (that’s both healthy and unhealthy fats) so I should check this out! The texture looks just right and I’m glad you found a solution to that weird after taste effect low fat cream cheese has-I know exactly what you mean! I bought some, tried it once, and decided it wasn’t for me. I’m glad to see I’m not the only one who thinks low-fat cream cheese has a really weird after taste! 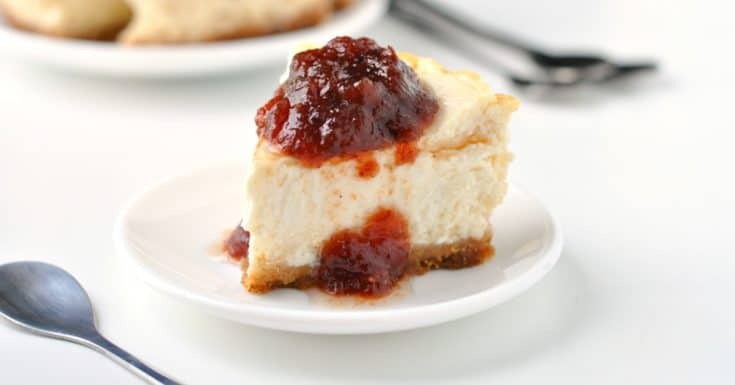 Seriously – one bite of this cheesecake and you’ll never believe it’s low fat! 250 cal a slice is quite the bargain! The ingredients sound good and really, who needs a deep crust? A will try! I love cheesecake, if it wasn’t so fattening I would probably eat it everyday. But your version is great, it sounds much lighter than the one that I usually make, need to try making cheesecake with natural yoghurt as you suggested. I know what you mean about eating cheesecake every day if you could – I would, too! I always use natural yogurt instead of Greek and it turns out perfectly. I LOVE homemade cheesecake! It’s truly the best! This looks delicious! I’m definitely intrigued by the idea of healthy cheesecake… I’ll have to share it with my friends who are all going to be on the healthy kick come the new year!